Sitting is such a paradox. After a long day, you relish the opportunity to plop down on the couch and settle in for the evening. 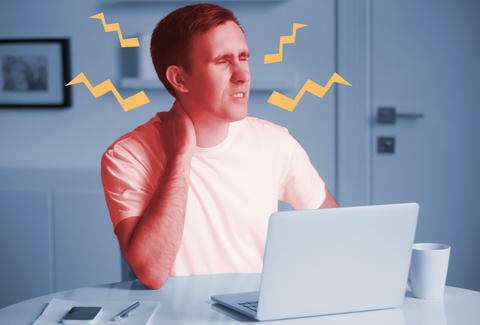 But cozy up in that same position (more likely on a poorly designed office chair than a plush sofa) all day long and you suffer a stiff neck, tight shoulders, and back pain. What gives? "Any position we hold for any length of time will eventually turn to pain because the body is not primed to do that," said Joan Vernikos, former NASA scientist and author of Designed to Move: The Science-Backed Program to Fight Sitting Disease and Enjoy Lifelong Health. She discovered that prolonged sitting can lead to similar health effects -- bone and muscle degeneration, along with back soreness -- astronauts suffer after spending time in microgravity. "Most people are sitting six to 13 hours a day. This immobility causes the illnesses we have come to recognize as modern disorders, like diabetes, obesity, cancers, heart conditions, and loss in blood volume," she said. While those diseases may take years to develop, the pain from sitting all day is immediately felt after getting up. Here's why everything hurts after a day spent chained to your chair. When you sit all day, you know what your glutes and calves are doing? Pretty much nothing -- except slowly wasting away. This could make for a sore, wobbly walk home, when your legs finally start holding you up again. "It's not the number of hours sat that's important, it's how many uninterrupted hours of sitting that matters," said Vernikos. When conducting a study on people lying in bed 24 hours a day, she found that standing up every half hour was enough to prevent the harmful effects of an otherwise immobile lifestyle. Taking a load off (and keeping it off for hours on end) can also make the blood build up in your veins, which causes unpleasant sensations like burning and cramping in the calves. Ouch. Sitting might be relaxing for your body, but to your nerves, it's torture. The unnatural position causes strained and pinched nerves, which results in pain throughout the body. "If you sit in one position long enough and you don't move, the muscle contracts. As it contracts, it pulls the nerves it's in contact with, so you go into a sort of spasm," said Vernikos. But since those nerves are pulled with every movement, shouldn't we feel pain all the time? Not exactly, said Vernikos. "It's one thing to stimulate the muscle to contract and relax when you're engaging in activity, but if you contract it and don't move for a long time, it can pinch the nerves and cause pain in the lower back and shoulders." You've probably seen those charts about how to sit properly -- shoulders relaxed, eyes level with the screen, arms parallel to the floor, back straight. But as your to-do list consumes the day, demands like managing your inbox and dealing with your boss eventually cause a breakdown in your posture. "You're slouching whether you know it or not. When you slouch while sitting, your head is pulled down and forward by gravity. Your spine will start to curve and your body will experience pain," Vernikos noted. Your spine has three natural curves it aims to maintain. Imagine how tying an 11lb weight -- the average weight of a human skull and brain -- to your neck would distort your spine. That's exactly what's happening when your head slouches forward when sitting. Vernikos suggests thinking of aligning your spine straight up and down, with force of gravity, to prevent aching when sitting. "If you keep your back straight and you think of gravity as a force that pulls in one direction, downward, like a vertical rod, you can align yourself to this vertical and spare your body from pain." Your spine is practically begging you to stand. An upright position puts the discs in your lower back in proper alignment and minimizes the pressure they endure. Sitting, on the other hand, forces the vertebrae to crunch down onto each other and bear a lot more force, increasing the risk of chronic lower back pain. "When you're sitting, your spine is compressing. In space, you get taller by 1-2 inches, and if you lay in bed, you'll also get taller, because your discs are expanding. But when astronauts return from space or people get out of bed, their vertebrae collapse onto each other and cause pain. This is also happening when you sit for a long period of time," said Vernikos. One big culprit of the pain from a compressed spine is the damage done to the cushioning between the discs. "The muscles have weakened and the vertebrae start collapsing, squeezing the padding and nerves between the discs. This is a huge source of pain," Vernikos added. Here's the good news: Studies conducted by Vernikos and other researchers have discovered that adjusting your position every 15-30 minutes prevents changes to your lumbar discs. So go ahead and get a fresh coffee, gossip with a colleague, gaze out the window -- do anything other than sitting a few times an hour, and you won't feel so much pain later on. Vernikos believes that one of the biggest reasons our bodies respond to sitting with pain is due to our natural instinct to move. "What I learned from my research is that the body needs to move, it has a biological need to move throughout our waking hours as the earth turns," she said. "When we don't move, we suffer." The pain is like a nudge to your brain that you need to move, to keep the body primed to flee any potential danger at a moment's notice. The primitive instinct may have less of a place in our modern, safe-space filled lives, but it's still a powerful driver toward better health and longevity. Vernikos suggests reacting to sitting-related pain with increased movement. Even something as small as standing to reach for a water bottle or walking to the printer are enough to counteract some of the painful effects of sitting, Vernikos pointed out. "You don't need to be running on a treadmill to condition yourself, you can tune your body to on-off movement throughout the day." Joni Sweet had perfect posture the entire time spent writing this article, she swears. Follow her on Instagram and Twitter at @JoniSweet.